Our venerable father Anthony of the Kiev Caves was one of the founders of the Monastery of the Kiev Caves. His feast day is on September 2 with St. Theodosius, and on July 10, when an appearance of the Mother of God foretold of his impending death. Anthony was born in 983 in Liubech, near Chernigov. He was named Antipas by his parents. In his youth he possessed a fear of God and dressed in monastic attire. As he matured he set off on a journey to Mount Athos, where he took to the monastic life. He received a monastic tonsure with the name Anthony, and set his life on a course of pleasing God and living an ascetic life on the path to virtue. He became known for his humility and obedience. In time, the igumen recognized in him a great future ascetic. Inspired by God, the igumen directed that Anthony should return to his homeland where many monks would come to him. Returning to the Russian lands, Anthony visited many monasteries near Kiev, but was not able to find the strict life that drew him to Mount Athos. In time, he came upon a cave that had been dug by the priest Hilarion (later to be Metropolitan of Kiev), near the village of Berestovo. Here he began his struggle in prayer, vigil, work, and fasting, eating only a morsel a day and sometimes not eating for week. In his ascetic life, people began to come to him for his blessing and counsel. Some who came decided to stay with him. Anthony's renown spread throughout the land, inspiring many to the monastic life. After twelve men had gathered with Anthony, the brethren dug a bigger cave, and within it made a church and cells for the monks. As the community became larger, Anthony appointed Barlaam as abbot of the monastery and then withdrew to another place to dig a new cave where he secluded himself. Nevertheless, monks began to settle around his new cave of seclusion. Thus were formed the Near and Far Caves monasteries. Later, a small wooden church, dedicated to the Dormition of the Theotokos, was built over the Far Caves. After the great Prince Izyaslav of Kiev convinced the igumen Barlaam to move to the Dimitriev monastery, the brethren, with Anthony's blessing, chose the meek and humble Theodosius, as igumen. The community of the Near and Far Caves continued to grow, reaching a population of hundred. Then, Prince Izyaslav gave the community of monks the hill where a large church and cells were built, around which a palisade was built. Thus, the renowned Monastery of the Kiev Caves came into being, the first spiritual center in the land of the Rus', raised up through the efforts of St. Anthony, without gold but on the prayers of saints and by their tears, vigil, and fasting. Many miraculous happening have been recorded associated with St. Anthony, including the appearance of the Mother of God before Ss. 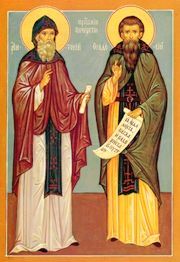 Anthony and Theodosius in the Blachernae church in Constantinople, without their leaving their own monastery, at which the Mother of God foretold the death of Anthony. He died on May 7, 1073, and his relics, through divine providence, remain concealed. In leaving the world you followed Christ according to the Gospel. Living there a life equal to the angels. You came to the Kievan hills. You led them to Christ. That he may save our souls! And in love you followed after him with your whole soul. While illumining the ends of the earth like a bright, shining sun. Therefore, with rejoicing you entered into the heavenly chambers. That we may cry out to you: Rejoice, Anthony our Holy Father! This page was last edited on October 22, 2012, at 20:10. This page has been accessed 29,890 times.